The color option in the drop down menu refers to the tip color. These are really pretty to look at, but I donÃ¢â‚¬â„¢t get enough vape through the tip for a lung hit. If you like a slower hit like a regular smoke, then this tip is really nice. I used an adapter and hooked it up to my smok baby g priv. I was not happy with the mod I bought I don't use it. 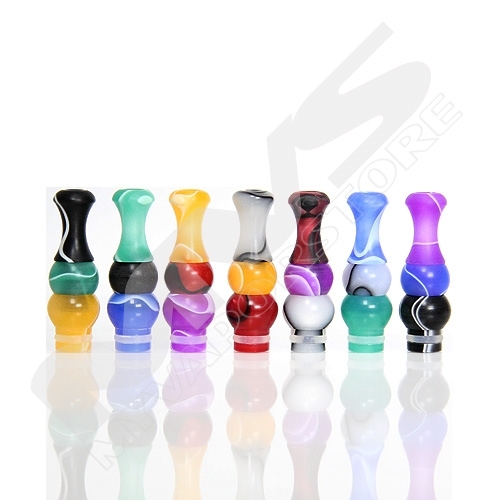 The tank vape piece or the drip tip is to big and it can not be changed. If I would have known that I would not have ordered it. VERY DISAPPOINTED. The e-juice is very good. I love the feel of it and the colors. I was upset because the bottom part broke off in the nozzle and I lost the top part. Also, it doesnÃ¢â‚¬â„¢t stay sturdy in the hole. I really like it and got compliments on it so IÃ¢â‚¬â„¢m gonna order it again and see how it goes since itÃ¢â‚¬â„¢s not expensive. I have already broken four of these things, they are great looking and I really like them but I guess I'm a little hard on them. They are a light plastic and I've broken two from dropping and two from doing something stupid like holding my vaporizer in my hand while pushing my self up from a low chair. I plan to get more because I love the look, but they are not really strong plastic.